What is the AcceleReader Program? The Chronicles of the Monster Detective Agency is proud to be a part of The Rogue Bear Press AcceleReader Program. This program was developed to create books that help improve the language skills of their readers. As young readers advance through succeeding volumes in an AcceleReader series, each book becomes progressively more challenging in structure, themes, and vocabulary. 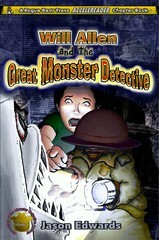 Fans of the Monster Detective Agency will find that the stories and characters grow with their readers. Each volume in the series gets progressively longer, with more challenging vocabulary, and more mature themes. As they grow older, Will and Jeannine face more complex issues and problems, just as their readers do.